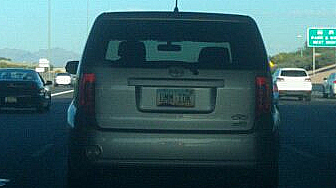 So, mid-last year, Camaron was driving on the freeway when he came upon a car with an amazing license plate. Here is the photographic evidence that he risked his(and probably some other driver's) life for. It soon became the wallpaper on his phone. I had a photo of the two of us on my phone, and he had this on his. And who could blame him?! ...but then the license plate fairy decided to sprinkle a little fantastic-license-y-ness dust on the whole thing by having me(who wasn't with Camaron when he saw this license plate on the freeway) witness this plate as well! And it wasn't just another happenstance drive-by on the freeway or what have you. I was doing my morning school duty of helping out with the kids being dropped off for school in the front parking lot when who should pull away right in front of mine own eyes? None other than "UMM IDK"!!!!!!!!!!!! The clever owner's child apparently attended my school!